When we feel healthy, we look healthy. A properly functioning digestive system is key to creating inner harmony, which enables your body to cleanse itself and stay regular. More and more studies are showing the importance of a healthy gut and its impact on overall health. Our supplements provide you with the digestive, metabolic and detox support you need. If you live outside the USA please Click Here for ordering and product information in your country. 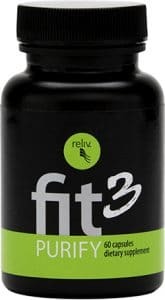 Keep your body in peak performance with Fit3 Purify. This monthly, 10-day body purifier includes a probiotic blend, liver cleanse and metabolic supporter in one. Other cutting-edge ingredients like peppermint extract and asparagus root extract support a healthy digestive track. Patented FibRestore provides 10 grams of soluble and insoluble fiber per serving. Did you know there are actually two types of fiber, each with different benefits? Your body needs both soluble and insoluble fiber. Unfortunately, most fiber supplements only provide soluble fiber to act as a “bulking agent” in the gut. The insoluble fiber in FibRestore provides added benefits you can’t get from a typical fiber powder. It’s a simple solution for better health.